I know. I know. I just can't stop making shaker cards and tags! Oh well, here's another one! 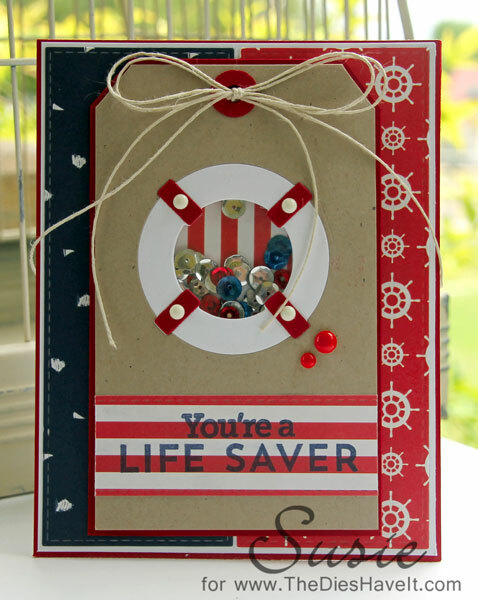 I used stamps and dies from MFT Stamps to make my card background and all the elements of my tag. I am just having so much fun designing these. A friend is coming over today so I can show her how to make some...so there will be more. Just warning you! This is gorgeous! Great idea making the life saver a shaker! hi Susie! this is precious, I so luv the split background, really makes the shaker tag pop! So glad you played along with Simon Says Stamp Wednesday Challenge! Another awesome one, Susie! So fabulous! Thanks so much for playing along with the Shake It! Challenge over at the Simon Says Stamp Wednesday Challenge Blog!